Tour de France – Do you speak Autism? 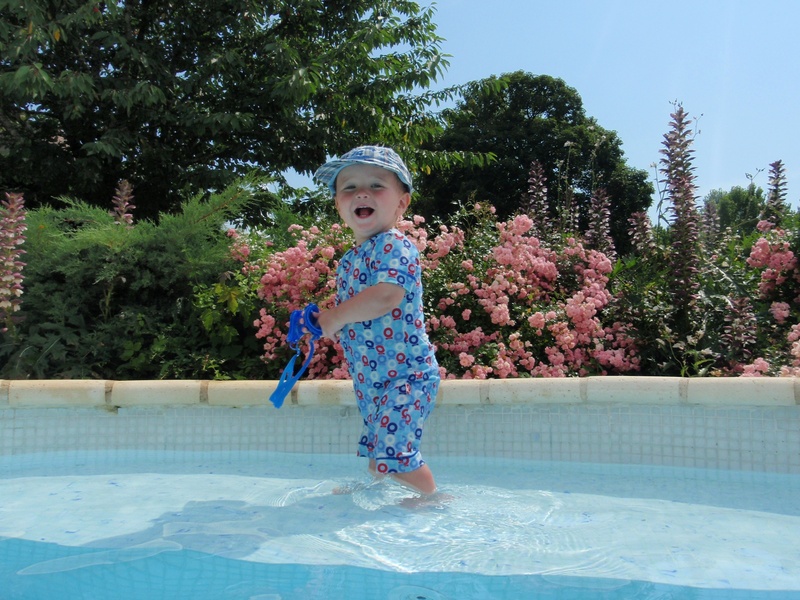 The first of my summer themed blogs- looking back at our road trip through France in July 2013, this time through James’ eyes (sort of). The Channel Tunnel was really exciting. All the cars drove inside the train and then we could get out and watch as we went into a big tunnel and when we came out we were in France on the other side of the road. We stopped for lunch at an aire and I ran into the car park and mummy was cross. We went to Disneyland. First we went to the Town Hall in Main Street to show them the letter from the paediatrician’s secretary Mrs Naylor and they gave mummy a special pass so that we wouldn’t have to queue for rides. Then we hired a buggy for me for when I got tired. The pass was really good because I didn’t understand about waiting and I got upset if I could see the ride and they wouldn’t let me get on it . Luckily we didn’t have to wait for my favourite rides which were It’s a Small World and The Pirates of the Caribbean. Sam loved It’s a Small World too, but he was a bit scared of the Pirates as it was dark and there were loud noises and the boat went down slides a couple of times which made me laugh. Then everyone else went on Journey to the Moon and mummy and nanna took us to the ice cream parlour so they could have a cup of tea. We stayed all day and had lots of fun. Sam and I were so tired we slept all night so mummy and daddy were pleased. Mummy and daddy, uncle Mike and Holly went to Disney Studios in the morning so nanna and grandad took us to the petting zoo to see the ponies and goats. I was watching the goat in her paddock and as soon as nanna turned her back to see to Sam, I climbed over the fence and went to talk to the goat. When grandad called me to come back, I was too excited to listen. Then I saw the little hut with a dark doorway and straw inside so I ran inside to explore. Suddenly a very alarmed goat rushed out and bowled me over – I don’t know who was more surprised, her or me! Grandad climbed over and hauled me out before I got into any more trouble. Nanna took Sam back for a nap while grandad and I played on the swings and the crazy golf and went to see some tepees. When mummy and daddy got back I had a nap and then we went to the swimming pool. The water was quite warm and daddy held me, but I was a bit grumpy after my nap so I wanted to get out right away. Mummy, daddy, uncle Mike and Holly went to Paris on the train while we went back to Eurodisney with grandad and nanna. We went on so many rides – it was great having the special card as we didn’t have to wait on most of them. It didn’t always work though. When we went to Main Street Station to catch the train which goes right round the park, we thought we were lucky as the train was in the station, but the disabled carriage was already full so we had to wait for the next one. The train driver was very nice and understood the problem as he has an autistic cousin, but he said rules were rules (like the Fat Controller) and he was very sorry. I didn’t understand why I couldn’t get on the train on the other side of the gate though and I had a meltdown for 20 minutes until the next train. People came over to see what the fuss was about and one girl took a photo which made nanna cross. She explained in French to a few people that I wasn’t being naughty and one lady offered me a lollipop. Nanna said thank you but it wouldn’t help. As soon as we got on the train I was happy and started smiling at everyone and talking about what we could see. We went on lots of new rides and when Sam had a nap in his buggy, nanna and grandad took turns to go on the rides with me. There was a lovely boat ride and a little train in Les Pays de Conte de Fées and we got to ride with some deaf people. They were signing but it must have been French as I didn’t understand it. When Sam woke up we had to do those rides again to be fair to him, but I didn’t mind. Then we went on Dumbo and he flies which was so exciting! We also did Pinocchio, Peter Pan and the big carousel, although we sat in the carriage, not the big horses that go up and down. Grandad said we only intended to stay for the morning but we were having so much fun it was 5 o’ clock by the time we left. On the way out, we walked through Disney Village and past Planet Hollywood. 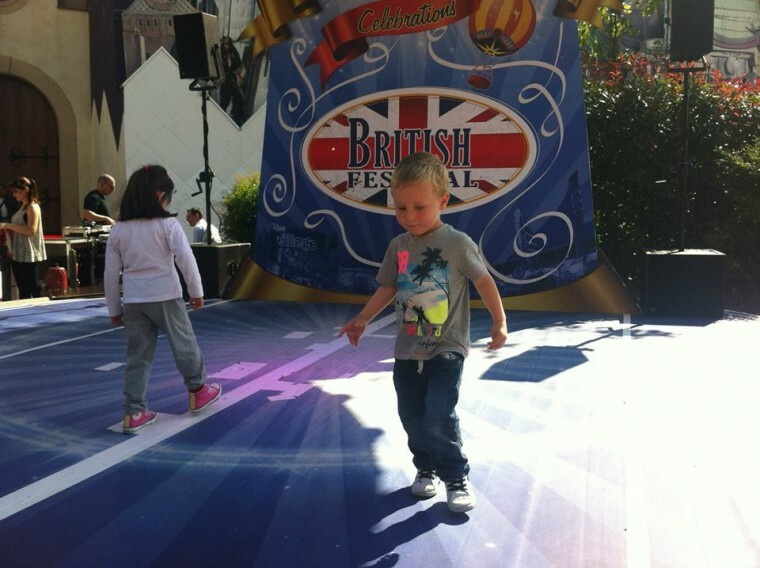 There was a British Festival that week and there was a stage with some girls singing Spice Girls songs. When they finished there was still music playing so some little girls jumped on the stage and danced around. Well I didn’t need asking twice, I was up there and jumping around with them, showing off my groovy moves like on Show Me, Show Me. Everyone was clapping and when the music stopped I froze like you are supposed to. Grandad got it all on video as well. When we got back nanna cooked us pasta and while we were having tea Mummy and daddy came back. I said bonjour to them – that’s French for hello and I can say au revoir as well. It is getting hot now and we have got to drive all day to the Dordogne. In the car I asked about Disney a few times but daddy changed the subject. I hope we get to go back there soon as I think it is my favourite place in the whole world and Sam agrees. We arrived at the gîte at 5.30 after six hours driving. It is in a very small hamlet next to the church and right on the River Dordogne. It is a really big old farmhouse with plenty of room for me and Sam to run around and the garden is brilliant with a big swimming pool. Daddy and uncle Mike blew up the rubber boats and I played in one until it tipped up. I didn’t like that so after that I just got pebbles and threw them in which is my favourite game. I did go back in the boat later though. Sam loved the water and kept trying to get in the way he gets downstairs by getting on his tummy and sliding in backwards. So mummy is going to get him a flotation vest tomorrow. It was very hot again. 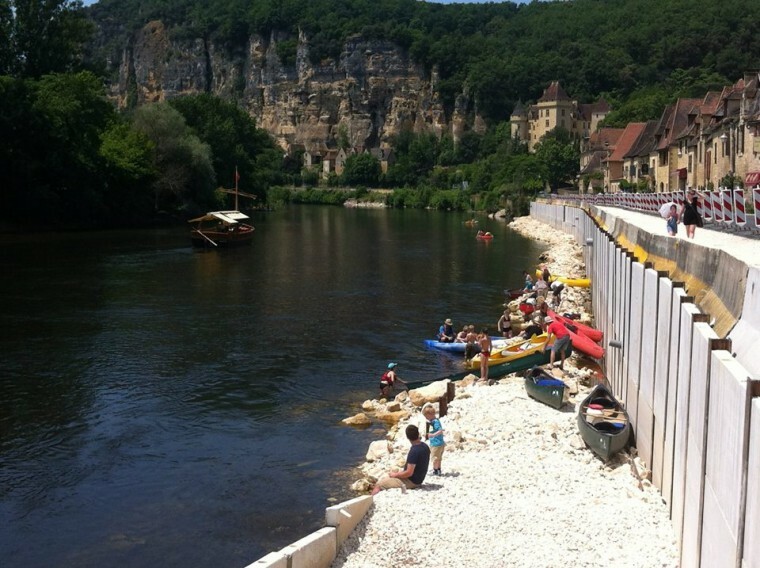 We went to La Roque Gageac which is a pretty village on the river. It was great fun throwing pebbles in the river. Daddy thought it was much better than me throwing them in the swimming pool as he didn’t have to fish them out! Then we went on a boat trip which I really enjoyed. Even though I don’t like getting into the water I love being on boats. The lady told us things in French but we had little tape recorders in English but Sam pretended ours was a phone and pressed the buttons so it didn’t work properly. We went to the river beach at Limeuil and we paddled and threw pebbles in the water. It was nice and shady under the trees and we had lunch there. There is not a lot to report because we have mainly stayed at the gîte. The grownups have taken it in turns to go sightseeing which would be boring for me and Sam. They also went on canoe trips which I would have liked but I am not old enough. We played around the pool and I pushed the grownups in – it was very funny. There was also a floating frog thermometer which I like playing with. I am starting to talk more in my own sentences and Sam is saying lots of new words as well – he is copying me and saying ‘Ready, steady go!’ Mummy thinks it is because our people have lots more time to give us their attention. When it gets too hot outside we go into the living room and watch a DVD. One of our favourites is Elmo’s Potty Time which I know by heart now. I went up to nanna today and said ‘I do peepee and poopoo right in the potty’. I had actually done it in my nappy but nanna said it was a start and I was a good boy for telling her. I said au revoir to the pool and the house and the nice church next door. I snuck out of the house a couple of times this week and went into the church. There was never anyone there but it was quiet and cool and there was a good echo when I spoke. There was also a statue which I thought was mummy and baby Sam, but daddy said it was Mary and baby Jesus. It was a long drive back north to a place called Gouvix. We stopped and an Aire for chips and hot dogs but it was still a lot of time in the car. Mummy says thank goodness for the DVD player. We arrived at the B&B at 5pm and it was an old house called a priory with a big garden and a huge pond. You couldn’t see the bottom but it was still fun dropping stones in. Nobody wanted to me to though, because the edge was very uneven. Daddy insisted on collecting the stones and holding my hand while I dropped them in, so that I didn’t keep running backwards and forwards to the edge. I got cross about him holding my hand and also when he stopped me climbing into the chicken run. The house was very interesting too, with lots an antiques and breakable stuff and I could see the grownups looking a bit edgy, especially as the owner was a grumpy old man. He spent a lot of time in the kitchen cooking a dinner for later but didn’t seem interested in doing any pasta for me and Sam, even though nanna had asked him before if it would be okay. Luckily we still had some sandwiches left so we had them instead. There wasn’t even a microwave to heat up our milk! Our two fellow guests, Alan and Simon were really nice and arrived on big Harley Davidson motorbikes which made a lot of noise and impressed me and the other boys. After Sam went to bed, the grownups had dinner and drank lots of wine and became quite noisy. It was uncle Mike’s birthday, which was nice for him. I played with the iPad but mummy and daddy had to take turns to sit with me. I think everyone was pleased to leave the house as soon as possible and take us somewhere where we could play. We said goodbye to Alan and Simon and drove to Courselles sur Mer on the coast. It had an enormous beach and even though I ran as fast I could I couldn’t get to the sea before mummy caught me. On the sea front there was a big roundabout and Sam and I insisted on having a ride before we went to Caen to catch the ferry. 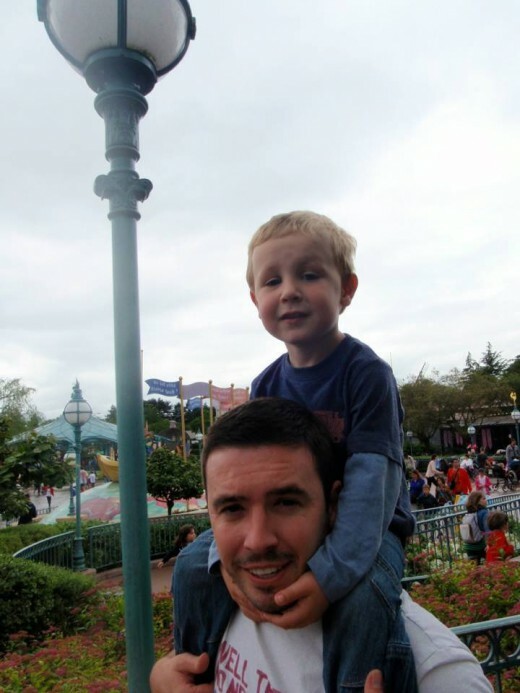 This entry was posted in Autism, Disability, Potty Training, Travel and tagged #ASD, #autism #parent #understanding #autismawareness #confession #positive, #parenting #autism #autisticspectrumdisorder #disability #behaviourmanagement #, DisneylandParis, Travel. Bookmark the permalink.